Q 3. beta is from 2010, when AJ HQ was kind of testing out aj, adjusting something here, adding this there. sorry! i forgot to mention the last animal with a patern when it starts, it is a giraffe... Please let this in!! I'm sorry! 3. Beta on Animal Jam was a period of time during the summer of 2010. This was the testing period, when everything was being tried out. There were no memberships and different items were tested and then removed (like skullies). Most heard about the beta testing Jam through NG Kids magazines. 6. The extremely rare, bright blue, beta Arctic Hood. 1st There were 2 floors. 4th GuideRabbit, Mister Glamcat and Prince Glamrose. 5th They use golden/yellow color. ... Can you explain number 6? There were a lot of different beta-only colors so I don't really understand it, and I don't wanna get the question wrong ._. Btw when's the deadline? Dang! those are some hard questions! Good luck whitefeather and all of those in the compitition! 3: The testing period before Animal Jam was fully released and Jammers could try it out and give feedback. I have two questions: what is a guide? and who is sizzlerat? hi lovelost great blog! Also i am not competing in the contest. just asking questions. Well, I didn't get through the first round, so I'll just be answering some of these for fun. 3. The time when the virtual world (in this case aj) is still being made. Question 1: There were origionally only two floors in the chamber of knowledge. Question 2: The only two animals in Animaljam that start out with a pattern are the giraffe and the tiger. Question 3: Beta is the beta testing that happened early in Jamaa when AJHQ was testing out the game to see if it would be popular. That is why things were so different in Animaljam then. Question 4: Two guides are GuideRabbit and GuideKit. Question 5: Guide chat bubbles are in green. ~Mysteryhorse the code is "horse"
Hey love lost, this is thunderboltwolfeh. I own purple gazelle horns, but people tell me they are only worth a yellow spike collar. nothing else. You own rares, do you know what purple gazelle horns are relaly worth? 1. The Chamber of Knowledge was originally 3 floors. 2. The only two animals that start with a pattern on them are Tigers and Giraffes. 3.Beta was the early testing period of Animal Jam. It was a lot different than what Animal Jam is today. 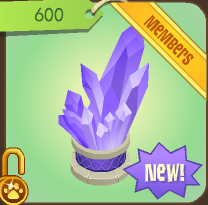 During Animal Jam Beta there was no such thing as "members". Everyone had access to every single item and feature. Also, items were way cheaper during Beta than they are today. During Animal Jam Beta, only six animals were available. These animals were the wolf, rabbit, koala, panda, tiger, and monkey. In early September, memberships were introduced to the world of Jamaa, scarring it for life. Memberships created a barrier between the citizens of Jamaa, dividing them into two separate classes (like segregation): members and non-members. 4. 2 AJ Guide's usernames are Fauna ToughClaws and Animal Jam Community. Not sure wat to do I just saw this.,.....,. Hey LoveLost, it's Fuzzy20151 from Little and Fuzzy's blog. 3.Beta was a time when AJ first started, and it was when everything was being tested.There were no rares or members, everyone could buy anything. How many rounds are there going to be Love? Or does it just depend on how many people get the answers right? Here are my answers for round two, along with Cheesecake. 1.) There used to be only two floors originally in the Chamber of Knowledge. They added tyne third floor, a small shop; the Mystery Emporium later on. 2.) The only two animals that commence their life in Animal Jam upholding a pattern are, Tigers; stripes and Giraffes; spots. Makes sense since they can be seen in the wild like that. 3.) Beta ia early testing for anything; computer games, etc. It was used when Animal Jam was a brand new game in July 2010. However, it is only used to test out the quirks of it, before officially becoming a game for all. 5.) Green. Originally I thought they were just special Jammers, when I first saw them in the cocoa hut, so I asked around saying, "How did you get the green chat bubble?" However no one answered so I left for Mt. Shiveer then came back, but it was hard because the room was full. Guess a lot of Jammers clump tags the guides, apparently. 6.) Either you mean Founder's hat, since they were the Founder's of Jamaa. It comes in yellow only. Or a skull in blue, but then they were discontinued and are no longer sold in Animal Jam (who knows? Could come back, I hope). I'll go with Founder's hat, the yellow top, the one I want to badly. #1: There used to be only 2 floors. #6: I'd have to go with Beta Arctic Hood or Beta Creature Mask. LoveLost notice that the crystal is the same color as the new den. When the castle den came out did any special furniture come out that matches the den?????? If you know please relpy! There was only 1 floor (2 rooms). All Animal Jam Guide's usernames are "Animal Jam Guide"... Do you mean their display names? If so, here are 2 names belonging to Animal Jam guides. The Beta Creature Mask with white eyes and red lips!!! 2. The Tiger and the Giraffe. 3. Animal Jam in early development. 6. Here goes nothing.... Light Green Old Blanket? Feel free to mock me. If you meant usernames, then GuideKit and GuideBunny. i know the answers to almost all the questions, can i tell them to u but not the contestants? im not one of the contestants, plus, i love ur blog! I go on it everyday! u got 85,445 more viewers in the last 2 months! Oh, wait! The Arctic Hood. The one that's turquoise with a light green eye is the answer to number 6! My bad! Question 3: It was when Animal Jam was basically testing.You see, when Animal Jam was first created,the creators didn't know if people would want to play it or not. So, they got a few people called beta testers to test out Animal Jam. That time of testing was beta. 1.The chamber of knowledge originally had 2 floors. 2. The animals are Giraffes and Tigers. 3.Beta is a test stage a website like animal jam goes through to become an official website. 5.Animal Jam Guides use a green chat bubble. animaljam guide chat bubble after a few under image4s this one is saying test and next to it is a smile in the bubble like an emocon in the bubble epic huh! 6 personily i think it was green green beta tiras blankets even tophats see open a new tab copy and paste this its a green top hat! u want onea those http://www.google.com/imgres?q=animaljam+new+chamber+of&um=1&hl=en&sa=N&biw=1024&bih=677&tbm=isch&tbnid=ODG7lX7KFPXomM:&imgrefurl=http://animaljamiskool.blogspot.com/2012/04/more-beta-picturesnew-item.html&docid=Oyexw5PgbOZ04M&imgurl=http://4.bp.blogspot.com/-ez9mICCLtMM/T56wVEOn4VI/AAAAAAAAABc/Tc8GijhN7hs/s1600/Aj%252Bchamber%252Bof%252Bmysteries.png&w=900&h=550&ei=Ew33T6rRHce90QGUtbnUBg&zoom=1&iact=hc&vpx=418&vpy=389&dur=4761&hovh=175&hovw=287&tx=183&ty=142&sig=107982457371759547025&page=1&tbnh=108&tbnw=177&start=0&ndsp=14&ved=1t:429,r:11,s:0,i:112 yeah i no long huh! well any way luv ya blog 4 ever <3 -epuc not compeeting btw!!! Lovelost,I got all of round one right but i didnt get a message telling me a coded and my name wasnt part of the 41.... I promise i am telling the truth! 3. Beta was the time before AJ went officially online when they were still perfecting it. People who played on it at that time were called beta testers. 3: Beta is something before the real thing comes out, where people test it out and see how they like it. And, something before its out to the public. 5: There is usally a green lining around the bubbles. mabey yellow, cant entirely remember. I'm going to be broke since Animal Jam makes everything so expensive! Maybe the Giant Crystal has something to do with the Fantasy Castle. The original color IS purple. Q3= beta is when a webiste, for example Animal Jam, was in its earliest stages. 3) The second letter of the Greek alphabet... A quality-control technique where software is tested in the environment for which it was designed, usually after debugging by the manufacturer but before releasing to the full public... And a period of time of Jamaa's history (summer 2010) where elements of the game were being tested and experimented with; different items, dens and such, some of which were removed. 3. Beta is a testing stage of a hardware product. what are you askingon the 6th one, i dont get it at all? ok im so sorry the one with no code is mine i forgot it and my code is tails and my username is phantomday! so sorry thanks! Lovelot, I would love to know why you are not responding to me it owuld make my day if yould just please respond why I am not part o the 41 when i totally should be!?!?!?!? It's hard to even make one reply, since my computer is an antisnail. Maybe you didn't comment in time or you only said one item for question one, etc. Not to berude but you should not believe everything you hear or someone says becausethye mightjust be lying. Lovey wouldn't lie :c Maybe you just made a mistake. Everyone can make a mistake. Who knows you might be living too. Not to be rude but I don't know.